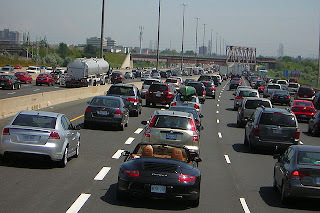 Traffic congestion along Highway 401 in Ontario, Canada. Image Credit: Robert Jack via Wikipedia. LEED experts have always suggested that LEED, aside from improving the welfare of its inhabitants, can also shorten driving trips, and dramatically decrease carbon imprint. Now, this theory has finally been confirmed as recent research showed that LEED for Neighborhood Development can actually lower driving rates than the average in a non-LEED metropolitan area. In fact, for 12 LEED-ND projects, the estimated vehicle miles per trip of a person ranged somewhere from 24 to 60% compared to the regional average. Projects that are highly urban and centrally located also have the highest shares of walking and lowest use of private vehicles. Even the least performing LEED-ND projects report 40% less driving than the average rate. The drastically lower driving rates find reason in the highly sustainable model of LEED-ND, where the rating is based on projects that must be within close proximity to each other and close to urbanized areas. Another highlight of LEED-ND is the necessity of walkable streets and densities, and several transit options. Green buildings and infrastructure are required to get a LEED-ND certification. Compared to other LEED rating systems, LEED-ND values not only individual infrastructure, but also location and land design. The figures were reported by Reid Ewing, a renowned transportation expert from the University of Utah, and published last April in the Journal of Planning Education and Research. Along with four other researchers, Ewing looked at 238 developments in six regions—Atlanta, Boston, Portland, Houston, Sacramento, and Seattle—in order to evaluate the transportation behavior of the people. The team then generated formulas for trip characteristics, including walking and transit use, trips for external automobiles, and internal capture trips. A preliminary analysis has already been done on the topic last 2010 by Eliot Allen of the Criterion Planners in Portland. In a demonstration analysis, he said that subscribing to LEED-ND can save as many as 12,000 lbs of carbon capita per year, resulting in an overall reduction of 30% in carbon. Norsteel fully supports neighborhood-scale efforts of environmental sustainability. 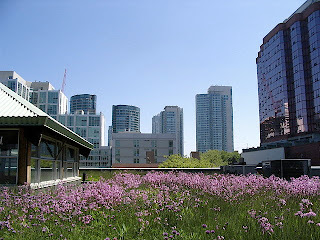 Talk to us, and we can help your building help your neighborhood, as well as the environment. JustGreen Logo. Image Source: JustGreen. EED certification? Now the process has been simplified so you can easily calculate if your building can be qualified. At Norsteel, we believe that green construction does not only have to be environmentally sustainable, it also has to be cost-effective. We have stumbled across an app that will give you instant green power quotes, to streamline your LEED certification process. The JustGreen Calculator, powered by JustGreen LEED from Toronto, is the first of its kind: an interactive tool that will help architects, engineers, construction firms, and enterprising homeowners get real-time quotes for their LEED points and for carbon offsets—just in time for the anticipated LEED v4. All you have to do is enter the project type, the square footage, and the building location, and you can subsequently obtain information regarding the carbon offsets, the associated costs, and the LEED points you can get for your anticipated project. When asking for an instant quote, you will be asked for the project name, the building type (from office and education to healthcare), the square footage, and your email. You will then get instant quotes for RECS and carbon offsets. Carbon offsets, otherwise known as carbon credits are about equalizing your building’s carbon emission contribution by supporting green and environmentally sustainable projects. It is a great tool to increase your LEED certification, as you can easily get as many as seven points up by purchasing JustGreen’s renewable energy credits. Of course, this is only important if you are planning full LEED certification, as carbon credits work on a more abstract level. If you are not looking to be certified, another suggestion is to instead use the money elsewhere, such as for energy-saving measures and installations. 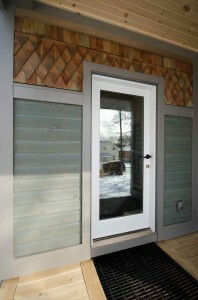 Door of the greenest home in Canada. Image Credit: Endeavour Centre. Norsteel is a firm believer that the commitment to go green should extend beyond industrial and commercial buildings and into the comfort of people’s homes. A perfect model is a self-sustaining green building near Peterborough, Ontario—a home that calls itself the greenest home in Canada. It is currently for sale at $649,000, according to the Endeavor Center, a non-profit school whose commitment is to building sustainable buildings. 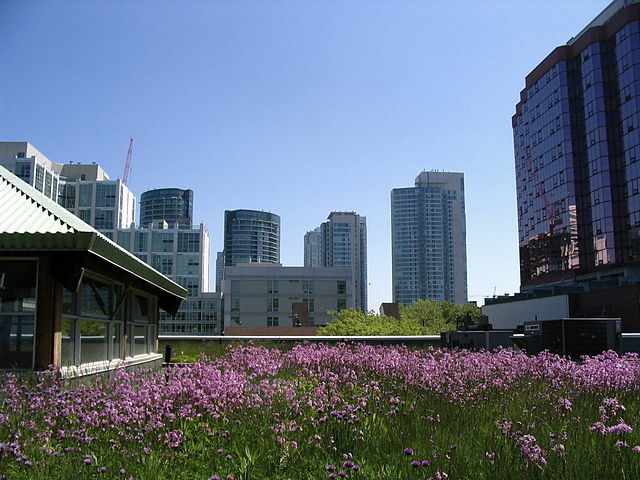 So what are the components that make this building the greenest home in Canada? Built over eight months, the 2,300 square feet home has three bedrooms, 23 windows, and even wheelchair accessible. The basement has a human waste composting system, which minimizes water usage by only using a tenth of liter every flush. The system is not only easy to use but also eliminates odor—leaving the odor-free compost as fertilizer. To avoid reliance on city water, the home has a rainwater collection system. The home was put together using environmentally-friendly and locally sourced materials within a 250 km radius. This means that there was a drastic reduction of carbon emissions compared to the construction of an average home. It has several green features, such as triple-glazed windows and straw bale walls among many others. The green home, though it may cost much as $60,000 to $80,000 more than the regular home, will save the homeowner more money in the long run because of the savings from energy and water consumption. The average homeowner pays $1,500 for heating, but this green home will only cost $350 annually for heating expenses. There are as many as 250 potential buyers who have gone to the open house. This just goes to show how interested prospective homeowners are to own a green home. If you are interested in having a green home yourself, you only have to turn to a tried and tested sustainable building company that has been in the business of green construction long enough to know how to create a home as environmentally sustainable as you want it to be.